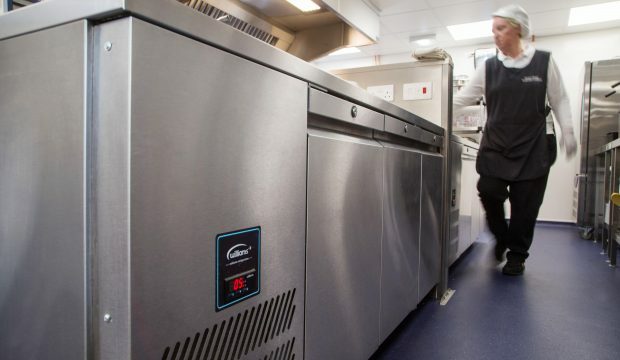 Williams products bring St Oswald’s kitchen into 21st century. Thirty years is a long time in the world of kitchens, but following a much needed, extensive refurbishment process, the cooking set-up at St Oswald’s Hospice is now up to speed to cope with the demands of patients, staff and hospitality events for many years to come. The Newcastle-Upon-Tyne based charity temporarily closed its kitchen for 11 weeks – relying on microwaves and hotplates to ensure no one, whether young or old, went hungry. Local contractor Sigma Catering Equipment was responsible for redesigning the catering operation and implementing the installation of a completely new setup. The Hospice can cater for up to 26 inpatients, while there can be as many as 20 day patients, alongside staff, carers and visitors. All may have an array of dietary requirements and nutritional needs, so careful investment in the best food storage equipment was vital. With this in mind, a Williams modular coldroom, two HJC3 Jade 3-door counter units, and a WBC40 40kg Blast Chiller were installed. All of the new refrigeration products have rapidly gained the approval of head chef Maureen Raper. “What we look for in refrigeration is temperature control and efficiency. That’s why we chose Williams Refrigeration,” she says. Essential to Maureen’s meals is the ability to prepare an array of dishes at the drop of a hat. The blast chiller’s 1-2-3 control panel technology, alongside its speedy capacity to cool food from 90°C to 3°C in only 90 minutes, has made it a standout piece in her eyes. In such a busy kitchen set up, with somewhat limited space, versatility is a must, and so the Williams products were also selected from a multipurpose point of view. This means that in addition to keeping ingredients in top notch condition, the units can be counted upon when things get a little congested.